SKU: BRAC-BO-H. Categories: Bracelets, Cuffs & Arm Rings, Heavy Braided Bracelets. 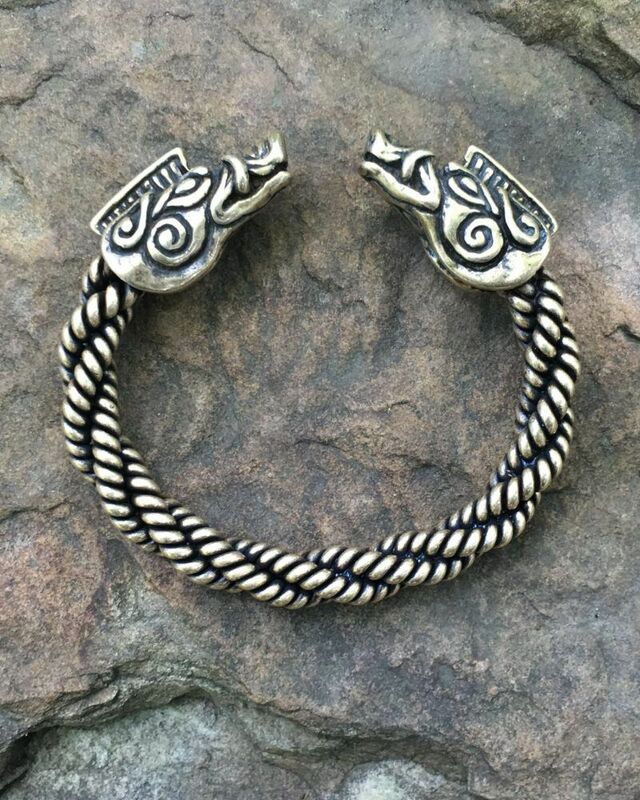 If you’re in the need of a little courage, try wearing one of our Boar Torcs. Our Heavy Boar Bracelet is not for the feint of heart! It is constructed with a heavy and very substantial braid of wire, and is approximately 3/8 inch (10 mm) thick. It is available in bronze and sterling silver. We also offer a Medium Boar Bracelet. The boar was also prized for its meat, and was the favorite game animal of the Celts. Boar meat was a symbol of hospitality. Any function of importance would include a feast with boar meat. Serving boar meat not only demonstrated the honored position of a guest; it proved the skill and hunting prowess of the host. The boar figures heavily in tales of the Otherworld, often in the guise of a trickster figure, full of cunning and mischief, often directly or indirectly involved in the death of the hero. The boar is also a frequent participant in the Wild Hunt (which you can read more about HERE). Sometimes heroes would encounter an enchanted boar, often a human involuntarily transformed into pig form as punishment for evil doings. In a Welsh tale from the Mabinogion, the hero Culhwch sought to win the hand of his beloved Olwen. However Olwen’s father, Ysbaddaden, was a forbidding giant who issues Culhwch with a lengthy list of ridiculously difficult tasks he had to accomplish before they could marry. The final tasks were to cut Ysbaddaden’s hair and shave off his beard. The giant’s beard was so tough that the only thing sharp enough to cut the beard was the tusk of Twrch Trwth, a terrible and savage boar with poisonous bristles! After a long and harrowing hunt, and with the help of his cousin, King Arthur, Culhwch finally managed to kill the boar. Upon the boar’s death, Culhwch learned that the boar had actually been an Irish king cursed into the form of a mad boar, and discovered a magical pair of scissors and comb between the boar’s ears. With these scissors he was able to cut the giant’s hair and marry his true love.